Genuine chrysoprase! HUGE genuine chrysoprase! In fact I have never, ever seen a piece of chrysoprase as big as this anywhere else in my life. And it is gorgeous and translucent and perfect, not a speck of black anywhere. 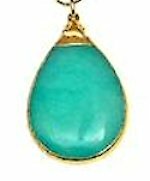 If you're familiar with chrysoprase you know how terribly expensive this gemstone is, and jewelry designer Devon Leigh obviously went out of her way to choose high quality stones for this design in her collection. To top it all off, the flat teardrop is beautifully set in solid genuine 24kt. gold foil for an incredibly smooth and shiny look that's very different, it almost seems to become one with the stone. If you're a chrysoprase lover, it's not likely you'll ever have a chance for a big stone at this price again! Guaranteed authentic, 1 available.